Nuzhat lives in Bradford where she completed an Education Studies degree with a subject specialism in English Language. She home-educated her two younger children for 8 years and started writing when they went on to further education. 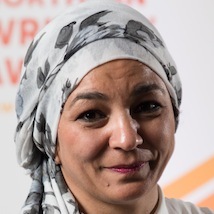 Nuzhat was one of 10 people selected for the Street Voices 5 Play Writing Course in October 2014, this was followed by her selection for the Dream Reality Radio competition in December 2014. Her play When George Came to Bradford was part of the Bradford Literature Festival and has been with recorded for the BBC Radio website.